New York waited months for Lebron James to come to the Garden. Fans readied to slam the "Miami Dream Team" consisting of James, Chris Bosh and Dwyane Wade. James had dissed the city by opting to sign with The Heat. Before the game, the New York media branded James "LeChicken" and depicted him as a bum. Knicks fans called Bosh "overrated." The hype surrounding the game was as expected -- it was the showdown -- not to be missed. Some fans paid hundreds, possibly thousands of dollars to watch the sold out game in the arena. But a lucky group of Knicks fans scored tickets through a twitter contest, The New York Knicks Night of Greatness, courtesy of American Express. The night of greatness never quite happened, at least for the Knicks. Like most heavily hyped games, they never quite live up to the hoopla. 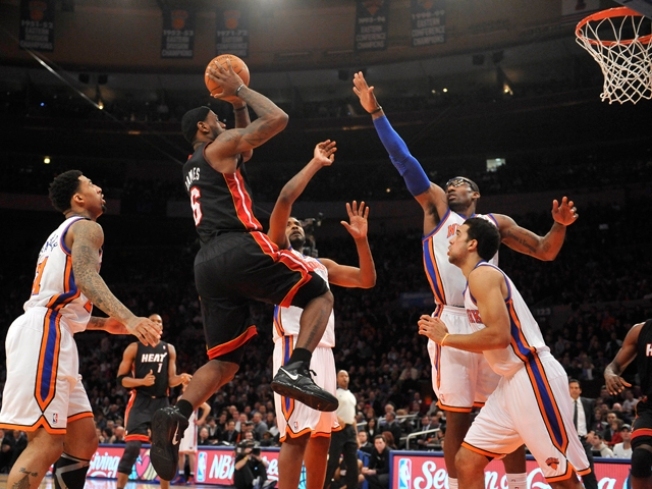 The Heat demolished the Knicks. James reigned as King of the court with 32 points, 11 rebounds and 10 assists helping the Heat's 113-91 victory. Despite the loss some fans still enjoyed the game. DJ Cassidy had people dancing in the aisles. The twitter winners mingled with Knicks legends like Walt Frazier, Earl Monroe and John Starks in a luxury suite. While the most notable Knicks fan, Spike Lee, enjoyed the game courtside along with many celebrities including 30 Rock's Tracy Morgan, rappers Drake and Fabolous, singers Maxwell and Joe Jonas, actor Liam Neeson, Top Chef's Padma Lakshmi, The Office's Craig Robinson and Giants player Justin Tuck.